So I’ve always been intrigued by the thought of “insane asylums” for some reason. This probably goes back to all the crazy nursing stories my mom has told me over the years of her time training at the state hospital back in the late 60s when people didn’t know as much about mental illnesses as they do now. Scary stuff, man. Scary stuff! There is a little event coming up on the 29th called Trick Or Treat! This is taking place over at The Shopping District. You’ll be able to find some cool Halloween/spooky/fall type things from some great designers. And from my understanding, a lot of things will be pretty inexpensive, so that’s always fun! I’m wearing the Girl Next Door dress by Apple May that will be at Trick Or Treat. It’s just a simple little black dress, but…it has blood on it and a knife in your side! Ouch! 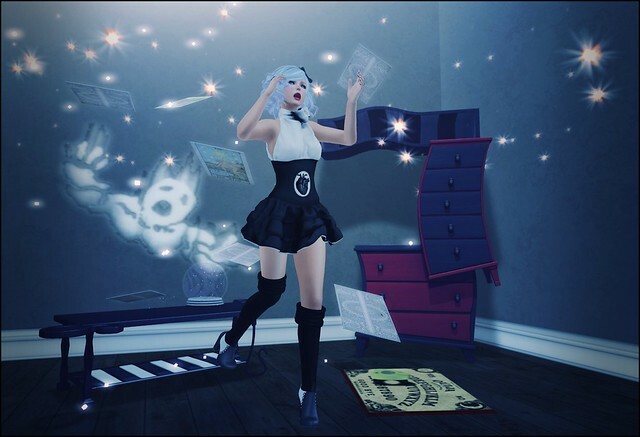 Trick or Treat starts on October 29th at 7pm SLT, so be sure to go get lots of treats! Hello there, bunnies! After 3 spooky type pics in a row, I needed a change of pace for this evening. We had a really delightful evening at home and truly, I just feel blessed for the SLife I lead. I’m wearing the Enchantress Timide dress by Faida & Fallen Gods Inc. that you can get at Wayward Halloween. It’s a rare item, but oh gosh, sooo worth playing for! It is just gorgeous! My favorite part is how it kind of pools at the feet and trails out. Love it! A good up-do works best with this dress, in my opinion, so I paired it up with the Cinnabun hair from the Fall Forever collection by Besom that you can get at The Epiphany. So pretty! You Want To Come To My Party? We’re less than 2 weeks away from Halloween! Woo! There are also lots of events going on! Some I’ve mentioned before, but opening up today is a new one called 20Twenty! 20Twenty is a discount event that is awesome! It starts on the 20th, lasts for 20 days, has 20 designers who offer exclusive items that are 20% off! Yay! It’s a mainstore event, too, so no worry about trying to cram yourself into a small space with lots of lag. Senzafine is in 20Twenty this round with the Kat dress. I love this and have been looking for a dress like this all month! It’s very Wednesday Addams! There are three packs and each pack has a HUD with a few colors. The black that I’m wearing here is from pack #1. And yes, I am re-wearing the Tara mesh head from Genesis Lab that I got from Wayward Halloween. My last look with this was more spooky spooky with the blind eyes and all, but I wanted to show that you can use the head with its “regular” eyes, too. Have fun with all your shopping! Hiya, bunnies! Can you believe it’s already the middle of October? Halloween is getting really close! And luckily for us, that means it’s time for Wayward Halloween!! Wayward Halloween is a spooky fun gacha event and oh gosh, you guys. If you love Halloween, you’re going to LOVE this event! I’m wearing the absolutely precious small Devil avatar from Naminoke. Look at the little face! You can change the hair color and the eye color of your avatar, too. There are different colors to play for, and two different “heads.” One of the things I love best about the Wayward events is that you often find stores that maybe you weren’t super familiar with before and they easily become one of your new faves! Wayward Halloween starts at 8am SLT on October 16th. I will be back then to update with the SLurl! Hello, super bunnies! Have you ever thought about being a superhero? Running around, saving the world from evil, making people safer even if it’s just for a day? Or maybe being a villain is more your style? Hey, sometimes the costumes are the same! Addams is at The Epiphany with this fabulous set! The Marion Hero set is just perfect for playing hero! There are 4 pieces to the set – the armor, boots, gloves, and mask – and it comes in 6 different colors. So play for all the pieces of your favorite color, or mix and match! How pretty is my Southpaw tattoo from White Widow, also at The Epiphany? SO pretty, right? I thought it went great with my costume. The Taylor hair by Bold & Beauty also has that cool superhero vibe, too. And it’s also at The Epiphany! One stop gacha playing! Happy Monday, bunnies! Do you guys ever just want to curl up in a blanket fort and forget about being an adult for a while? Well, thanks to the new round of The Epiphany, your dreams are about to come true! Stockholm & Lima has the coolest new gacha set to play for! The Failed Adulting set is perfect from start to finish! 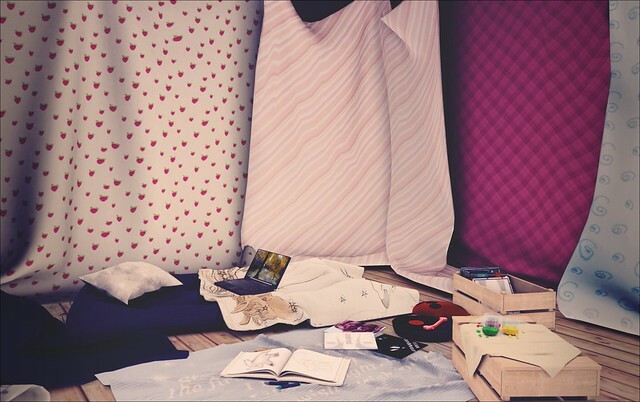 The Blanket Fort Skybox is so wonderful on its own before you even start to furnish it with cute little pieces like the bed, record player, candy bowls, and other items you see in this photo. Don’t forget, if you play at The Epiphany and get extras that you don’t want/need/can give away, you can trade them in for points! And the points can be redeemed for exclusive items! The Epiphany starts today at 12pm SLT, and you’re gonna love it! Hello bunnies! Hey, it’s almost the weekend! And lucky for you, there’s lots of shopping to do this weekend! The Seasons Story is opening up for a new round on the 10th, and it’s the anniversary round! Woo! That means lots of gifties and a whole lotta discounts. Love it! I’m also in love with the Autumn Jacket by Aphorism that you can get at the event. The sweater underneath is color change. Hey, bunnies! I’ve got another Halloween-ish pic today! What can I say? When the designers make the spooky and weird, you go with the spooky and weird! Collabor88 is open and their theme this month is Burtonesque. I love Tim Burton movies, so this is fun to me! Second Spaces is there with the Burton table and dresser. They’re so cool! The table’s stripes reminds me of Beetlejuice! Speaking of which, Ingenue is also at C88 with the Lydia D booties. Sooo cute and so much like something Ms. Lydia Deetz would wear! The Liaison Collaborative also is bringing the spooky, and how awesome is this Nathalie dress from Dead Dollz?? I’m so in love with it! I hope you guys are having a spooky fun week!